white Paint colt with the big dewey eyes. Our motto "You don't have to be perfect to live here" and the "No kill"
rule we live by, has proven to be the perfect haven for him. handle him. We figured "if he could just earn his keep, we'd be happy." "pets" and 4-H project mares. All but 2 are black and white. 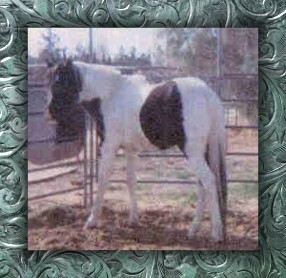 and has normally produced a 50/50 color pattern and dark eyes. he's covered, given the foal owner precious foals at a very reasonable price. "my colt was born broke." Owner Jim, loves a challenge and this was it. mainly letting them know where to bring the hand outs. If you are looking to breed for disposition and brains, Consider Scooter! He's a "Diamond in the rough" and is doing his job, and doing it well.